There's nothing quite like a game of blackjack. Pitting your skills against the dealer, enjoying the sights and sounds of the casino, and seeing if Lady Luck is on your side. Playing the game online is a great way to get your blackjack fix, but there are plenty of differences between it and playing offline. For example, you'll need to find a payment method that you can rely on before you can deposit some cash and start playing online blackjack. Interac is a fantastic option for Canadian card sharks, with a couple of different ways to make a deposit. Because of its stellar blackjack selection, we rate Jackpot City as our gold medal winner. Although they do provide debit cards, which can be used on gambling sites where accepted, Interac's most interesting service is its e-Transfer offering. On this page, we'll be writing primarily about why e-Transfer is so well-suited to online gambling. Making a deposit/withdrawal using an e-Transfer is very similar to making a payment using your online banking account, only with one key difference. In this scenario, you aren't actually paying the Interac online blackjack site – you're paying Interac, who then transfer the money on your behalf. We'll cover why this is beneficial for users further down the page, but players should note that they will find Interac extremely easy to use if they've ever made a payment on the web using online banking. To make an online blackjack Interac payment, you first of all need to find an Interac blackjack site i.e. one that has applied for an Interac merchant account and been accepted. You'll find plenty of these below if your usual site doesn't qualify. Then, simply indicate that you want to make a deposit using an e-Transfer. You'll be prompted to enter a few details, how much cash you want to transfer etc. The payment will then be triggered virtually instantaneously, with a small fee being deducted by Interac, and you're ready to play. The best thing about using Interac is the way it bridges your online gambling account(s) and your bank. Sites can only claim as much of your money as you've sent via e-Transfer, and can't use your payment details to make further withdrawals because they never actually get access to any of your data. In 99% of cases, this isn't something you'd need to worry about anyway – the vast majority of sites are completely above board and would never try to con you or make fraudulent withdrawals. Even so, knowing that there are measures in place to protect you if you do run into a rogue blackjack site is very comforting. Using an Interac online blackjack site or casino is not only very safe, but quick too. Deposits usually clear instantly – as fast or even faster than other digital payment methods – and making a withdrawal is speedier than waiting on a wire transfer or physical check. Finally, there's also the fact that Interac is designed specifically for use by those in Canada. If a gambling site accepts it, that's a clear indicator that they welcome Canadian players and will probably accept CAD too. This isn't exactly an advantage of Interac, but demonstrates why those in the Great White North are bound to have an easy time playing at an Interac online blackjack site. Now, a bit of bad news – because Interac only serves Canada, which represents a very small share of the worldwide online gambling market, not every casino supports it and even those that do may not spend much effort advertising the fact that they do. This doesn't mean that there aren't plenty of Interac online blackjack sites out there, because there definitely are. But it does mean that, unless you know where to look, you could find yourself going around in circles looking for somewhere to use e-Transfer to play cards. Fortunately, we have a solution that means there's no need for you to do so. We've spent a long time rating and reviewing the best blackjack sites out there that accept Canadian players, based on things like the range of games they offer and how effective their customer support is. On this page, we've compiled a list of top Interac gambling sites that offer at least one type of blackjack. So, all you need to do is pick one, claim your bonus and make your first online blackjack Interac payment. It should clear within a matter of seconds or minutes, so you could be hitting the tables within the hour. Gamblers interested in playing at online blackjack websites using Interac will enjoy rapid transactions, low-cost fees and simple and secure service. Interac is one of the most reliable debit-based transaction services available today, and it’s a good solid option for gamblers that want to get started fast and at an affordable rate. Interac works by transferring money between financial institutions online in real time the moment that a transaction is enabled. In terms of gambling, the player can deposit money by connecting their bank to the casino’s using Interac as the gateway. Deposits happen nearly instantly and the player can begin gambling right away. 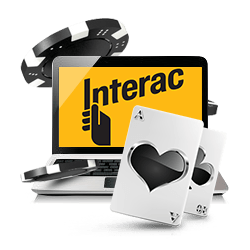 Can I gamble online using Interac? Yes, Interac is ideal for online gambling. It’s secure, it’s fast and highly convenient when used for gambling at any online casinos that accept the payment method. Does Interac come with additional fees? Interac comes with very minor fees for withdrawals and deposits to and from your casino of choice. These fees are much less than $1.00 and make transferring money with Interac more affordable than with most other solutions. Casinos will generally pick up the fee during deposits, but will charge a small fee to customers withdrawing with Interac. Fees are generally less than withdrawals with most other methods. How is Interac compared to other debit-based payment solutions? Interac is one of the few live transfer solutions working with banks, which is why the service is faster and more reliable. Players can quickly transfer money into and out of casinos without having to wait for information to post to financial accounts. 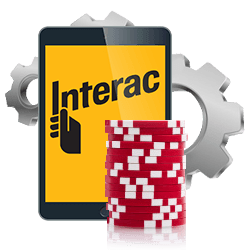 Is Interac safe to use at online casinos? Yes, of course. All transactions are sent through secure gateways and account information is never given away. 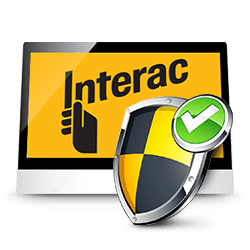 Players that use Interac don’t have to worry about the safety of their account, and they are the only ones that can access the account with a secure password.